The world of the avant-garde can be a scary, surreal place filled with alien sounds implying virtual landscapes ranging from the bizarre to the nightmarish. 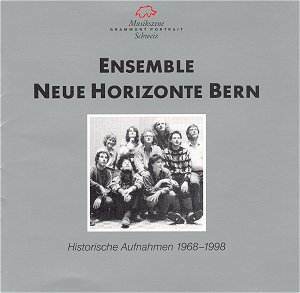 Since their inception in 1968, the Ensemble Neu Horizonte Bern (New Horizons Ensemble) has been exploring that world, seeking out music that was ahead of its time, experimental, radical, misunderstood, or otherwise strange and bringing that form of music to the audience that seeks it out. For more than 30 years they have served as musical guides into the wilderness of the avant-garde, and on this recording they capture and put on display some of the more interesting and captivating of these strange musical creatures. There is a broad range of avant-garde music contained here, from tape and electronic pieces to acoustic works performed on both traditional and prepared instruments. There are works of serendipity and chance contrasted with works of extreme constructionism. The overriding theme of this music is that it all contains that desire to explore musical realms and tread on as much virgin territory as possible. The group itself is excellent, able to find ways of performing the most difficult of works with a sense of polish. The instrument choices made by the composers being what they are (On one track, Frey occasionally favors a bird whistle accompanied by violin for instance) could make for difficult listening were the performances not so well done. The extreme dissonances would be nothing but noise were the performers not so careful to underscore the musicality of the pieces. They serve as noble vanguards as we trek through the world of the surreal. In short, this album is not for all tastes, but is an excellent example of the very best of the exploratory music of the late 20th century. Cage, Rzewski, Wolff, and their companions are all too often misunderstood, not only by the general populace, but also by those attempting to perform their works. By design, Ensemble Neue Horizonte Bern sets out to both understand the works and perform them as the composer intended. This noble attempt at bringing to life this music, which would all too often be ignored, can be viewed both with admiration and appreciation by modern composers and fans alike. If you have an interest in musical experimentation, avant-garde works, or post-modernism in any form, this would be a collection that would interest you. Indeed, it would be difficult to find a better collection of this kind of performances, especially by a single group.